Amid the ongoing fighting in South Sudan, Secretary-General Ban Ki-moon is reaching out to key leaders in the region seeking a political end to the crisis, while the Security Council has urged all parties to immediately cease hostilities and exercise restraint to prevent the further spread of violence. Mr. Ban told reporters in New York that the UN Mission in South Sudan (UNMISS) is in the process of verifying reports that many people have been killed and injured amid the factional fighting, which has uprooted thousands of civilians in recent days. Media reports say that hundreds of people have been killed since the clashes between members of the national forces, the Sudan People’s Liberation Army (SPLA), began over the weekend, following what the Government says is an attempted coup by soldiers loyal to former deputy president Riek Machar, who was dismissed in July. UNMISS said it has observed a “noticeable improvement” in security conditions in much of the capital, Juba, today. The Mission lifted restrictions on the movement of its personnel, and has resumed patrols on a limited basis in the city itself and restored flight service to and from the Ugandan city of Entebbe. “Life in the centre of town is returning back to relative normalcy. 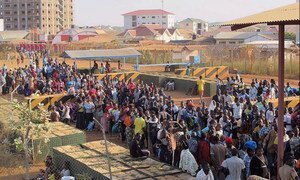 The safety of civilians in the South Sudanese capital remains a concern, however, especially on the city’s outskirts,” the Mission said in a news release. Meanwhile, security conditions in Bor, the capital of Jonglei state, have deteriorated significantly during the course of the day, with heavy fighting reported this morning, the Mission noted. The violence triggered an exodus of civilians out of Bor, and thousands have sought shelter at the UNMISS compound on the outskirts of the city. Mr. Ban called on the Government to cooperate fully with UNMISS – which is also sheltering almost 20,000 civilians in its two compounds in Juba – as it fulfils its civilian protection mandate, including in the provision of basic relief and in conducting investigations into alleged human rights abuses in recent days. He said that he spoke yesterday with President Salva Kiir, urging him to do everything possible to end the violence and to ensure respect for human rights and the rule of law. “I also impressed [upon] him the need to resume dialogue with the political opposition,” he added, welcoming reports this morning that the President is willing to enter into such talks. “This is a political crisis, and urgently needs to be dealt with through political dialogue. There is a risk of this violence spreading to other states, and we have already seen some signs of this,” said the Secretary-General. Meanwhile, Hilde Johnson, the Secretary-General’s Special Representative and head of UNMISS, remains in constant contact with the Government and others with influence on these issues – including a meeting with President Kiir today, where similar messages were conveyed. For its part, the UN Security Council has urged all parties in South Sudan to immediately cease hostilities and exercise restraint to prevent the further spread of violence. In a statement issued to the press last night, the 15-member body voiced “serious concern” over the fighting that began on 15 December and is continuing in the capital, Juba, and other areas, as well as over the risk of targeted violence against certain communities. “The Members of the Security Council urged all parties to immediately cease hostilities, exercise restraint and refrain from violence and other actions that could exacerbate tensions,” said the statement, which followed a closed-door briefing by Under-Secretary-General for Peacekeeping Operations Hervé Ladsous on the latest developments. Council members also commended UNMISS as it seeks to provide shelter, protection and humanitarian assistance to the affected civilians and to open the dialogue between key leaders to bring a resolution to the crisis. The Mission has been on the ground since July 2011, when South Sudan became independent from neighbouring Sudan, to consolidate peace and security and to help establish conditions for development. Amid reports of continued clashes today in South Sudan, senior United Nations officials are calling for restraint and protection of civilians, regardless of their communities.